The agency's new lead certification program for contractors means well, but will it work? Hudson found old lead-tainted construction debris buried in her yard. Victoria Hudson knew something was wrong when her Early Girl tomatoes started coming up deformed. They were the size of cherry tomatoes and appeared, as Hudson recalls, "dead and moldy." Worse yet, the plant's stem had turned a sickly black, something she'd never before seen throughout the many years she'd been growing tomatoes in other locations. The problem, she figured, lie in the soil. 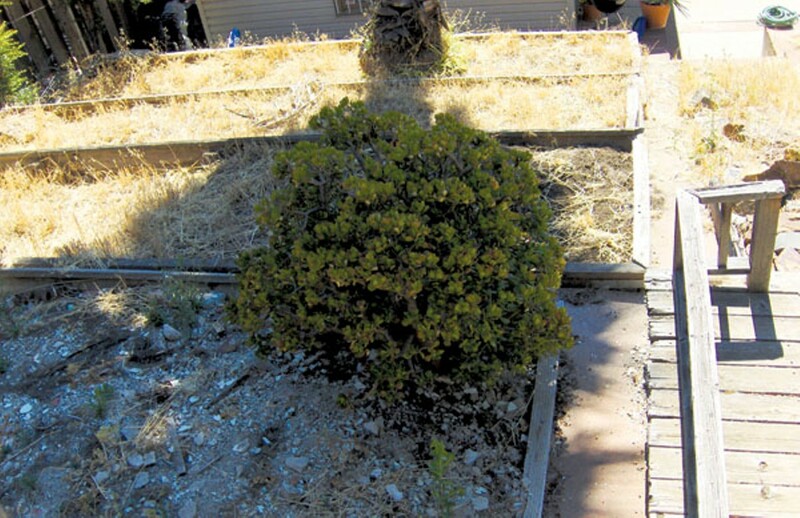 Further investigation into her East Oakland yard revealed a frightening discovery: The previous owners had buried debris from a 1980s remodel project — including entire walls from the living room, dining room, and kitchen — directly under the dirt. Multiple layers of lead paint dating back to the house's construction in 1940 were deemed the most likely culprit, and Hudson now faces the prospect of having to remove huge quantities of lead-tainted soil from her yard. Disposing of leaded soil is never an easy proposition, but it's about to get even more painstaking. In April, the Environmental Protection Agency decreed that by the end of the year, contractors throughout the country must adhere to a strict and exhaustive set of safety guidelines when working with lead paint or dust. Contractors who do remodeling work in homes, child-care facilities, and schools built before 1978 must register to attend a one-day lead-safety training course by October 1, and at least one trained renovator must be on-site at any job where lead is present. Additionally, firms must pay the EPA a fee of at least $300 to be certified lead-safe for a period of five years. When the EPA begins enforcing these requirements in January 2011, contractors found to be in violation could face fines of up to $32,500 per day per incident, according to EPA spokesperson Enesta Jones. While acknowledging the serious health hazards posed by lead, some local contractors are none too thrilled with the EPA's new program. David Grubb, owner of Berkeley's David Grubb Construction, Inc., attended a lead certification course offered by Alameda County about six months ago, before the EPA extended its deadline from April to October. "Most of the people who were there were feeling a little bit like it's another one of those requirements that are coming down on contractors that feels like a burden, another place where if we're not doing things quite right we might be breaking the law and facing huge fines and consequences," said Grubb. "Nobody's excited about that." Grubb said his company, which paid nearly $600 for the class and certification, follows green building principles and has always been conscious of airborne toxins including lead and asbestos. He feels that the EPA's requirements, which demand the use of large amounts of disposable plastic barriers, including the double-bagging of all construction debris that may contain lead, are environmentally shortsighted. "The EPA is solving a lead problem in one place and making a huge lead toxic soup in the bottom of a landfill somewhere else that's going to leach out into the environment," he said. Eric Grunseth, owner of Alameda's Pacific Northwest Painters & Construction, Inc. for thirty years, has his own misgivings about the EPA requirements. "If you're following OSHA, you're already doing all this anyway," he said, referring to the workplace safety requirements set by the Occupational Safety and Health Administration. "It's redundancy, total redundancy. If you're protecting your workers anyway, this is just one more agency that's grabbing money from you." He does, however, foresee one benefit: The requirements will level the playing field for contractors by forcing them to adhere to some of the same standards. Throughout Oakland, Berkeley, and Alameda, where the vast majority of homes were constructed before 1978 and are likely to contain lead, the new practices should become universal. Contractors who were previously able to undercut businesses like his by downplaying lead dust containment and cleanup, Grunseth said, would be forced to raise their prices to cover the cost of compliance. According to Grubb, the premium could be at least 10 to 15 percent for demolition jobs. Maria Doa, who runs the EPA's lead paint program and serves as director of its National Program Chemicals Division, defended the program as essential for educating contractors on the hazards of lead and for minimizing residents' exposure to lead during renovations. Guidelines include using plastic sheeting to contain dust within the workspace, reducing or eliminating foot traffic between living spaces and work spaces, and employing multiple-step cleanup procedures. "It doesn't take much dust to poison a child," she said, "but everyone should minimize their exposure." According to the EPA, more than one million children in the United States suffer from lead paint poisoning, which can cause damage to the brain and nervous system, behavior and learning problems, slowed growth, hearing problems, and headaches. In adults, lead exposure can cause reproductive problems, high blood pressure, nerve disorders, memory problems, and muscle and joint pain. To implement its new certification program, the EPA has accredited nearly 19,000 training providers throughout the country, who have in turn trained more than 315,000 contractors. Doa said the number should rise to around 400,000 by the October deadline, at which point training will continue indefinitely, but in reduced numbers. Trainer providers are free to set their own fees, which usually range between $200 and $250 per class, Doa said. The one detail that remains murky is how the EPA will enforce its new requirements. Jones said her organization will use a variety of methods including inspecting work sites and reviewing records and reports. For at least the first year, however, the plan appears to rely on citizen tips and complaints. This would require homeowners to be familiar with the guidelines. An online EPA directory allows users to search for certified contractors in their area — and Doa said the organization has spent around $2 million on outreach through trade conferences, home and garden shows, mass mailings, public service announcements, and others. Still, the extent to which the information has reached the general public is unclear. Hudson, for one, had no idea. "The consumer, the homeowner, we're kinda left on our own to safeguard ourselves," she said. "If it hadn't been for my contractor, I wouldn't have known about this."